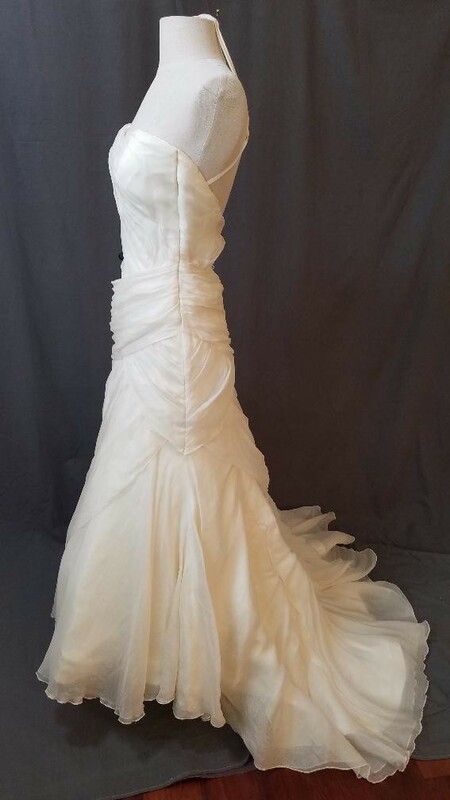 Beautiful Marisa silk voile wedding gown. The draping of the fabric is amazing. This is a delicate, feminine dress - but make no mistake, it is made for a heavy duty day! Inside of the bodice is full boning, heavy lining, and an interior back strap/corset to hold you in and keep the dress on you the way it should be. The bustle has already been added in, which will save you $200-$300, depending upon where you live and the tailor you take it to. This bustle is made by attaching laces underneath the skirt. As you will see from the photo, the laces are all numbered to help you know what to do, which is very smart! Measurements are 32"x27"x36.5", and length from underarm to floor is 44" not including the train. Dress has been cleaned, and is in good condition, although the stitching on the bottom of the silk is a bit tattered and slightly darker than the skirt. The good news is that it does not show, but I know you do not want any surprises on your dress (please see last photo). I am happy to answer any questions, and I ship (almost) anywhere!